Our friends Melanie and David had Adrian and me over for dinner not long ago and Melanie expressed her frustration in finding a modern looking pepper mill that didn't cost an arm and a leg. Her current pepper grinder had been mysteriously broken and she needed a new one. Drunkenly, I said that making a pepper mill was easy and I'd make her one. 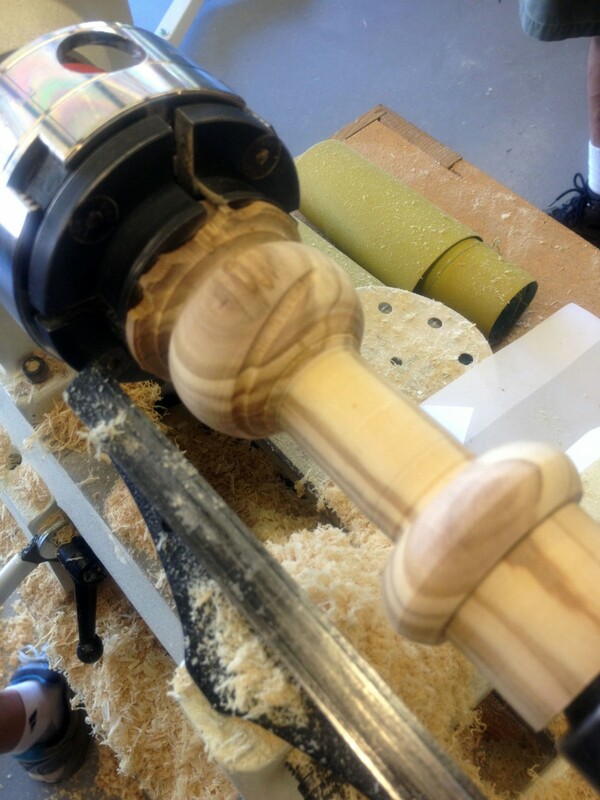 I know that they sell salt and pepper mill kits at Rockler, I know how to use a lathe, how hard could it be? Kinda hard, it turned out. But also pretty fun. The folks at Rockler gave me a ceramic grinder kit, an olive wood turning blank, and instruction booklet. They were also kind enough to give me a carbide turning set to try out. I highly recommend buying the instruction booklet if you're new to turning. The one-sheet instruction booklet included with the crush grind mechanism is really not that informative. I was still pretty confused after reading the more detailed booklet, so I enlisted some help from one of my favorite turners, Pete Carta. I know Pete from the El Camino Woodturners Guild; he is part of the team of turners that run woodturning classes at El Camino. Pete also works at Rockler and told me about a new thing they're doing at Rockler, which is private instruction for $25/hour. Perfect! She gave me some examples of what she wanted, this image of old Dansk pepper grinders. She liked the one on the far right. So I headed off to Rockler with all my gear and Pete and I got to work. Tutorial of how to do it after the jump. 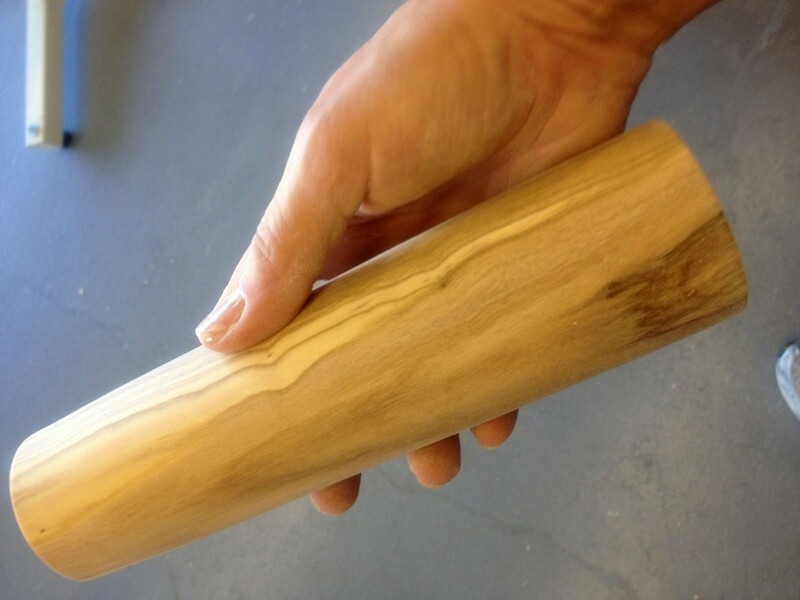 Using a roughing gouge, round out the stock. Notice that I did not take it all the way to round. We wanted to save as much material as possible, so to preserve the material, I didn't round it out all the way. Draw a rough sketch of the shape you want your pepper mill to take. Make 3 tenons. 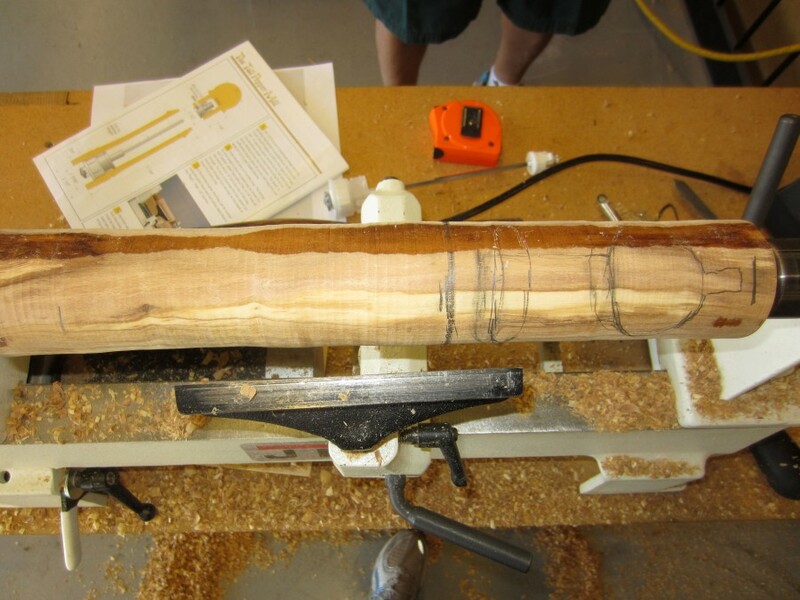 We made two tenons on the bottom portion so we could drill out the inside of the bottom from both ends due to the long length. The tenon on the top was so we could shape the top using the scroll chuck. For these I used the square carbide tool. The square shape cut these tenons ultra fast. 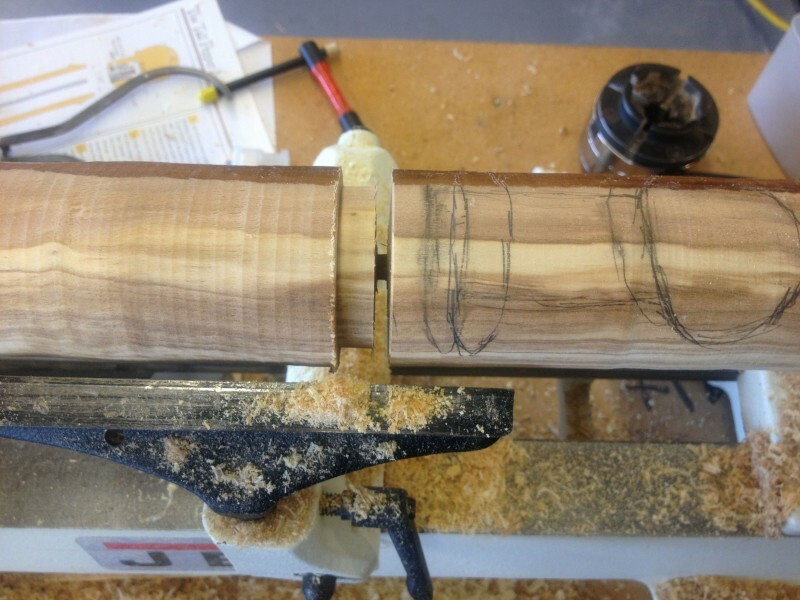 Measure your tenons to make sure they're the correct size for your scroll chuck. Using the parting tool (or in my case, the diamond shaped carbide tool) part off the middle tenon, marking which side is the bottom of the top of the pepper mill, and which side is the bottom of the top of the pepper mill. This will be useful later when determining which size forstner bit to use to bore holes in the body of the mill. 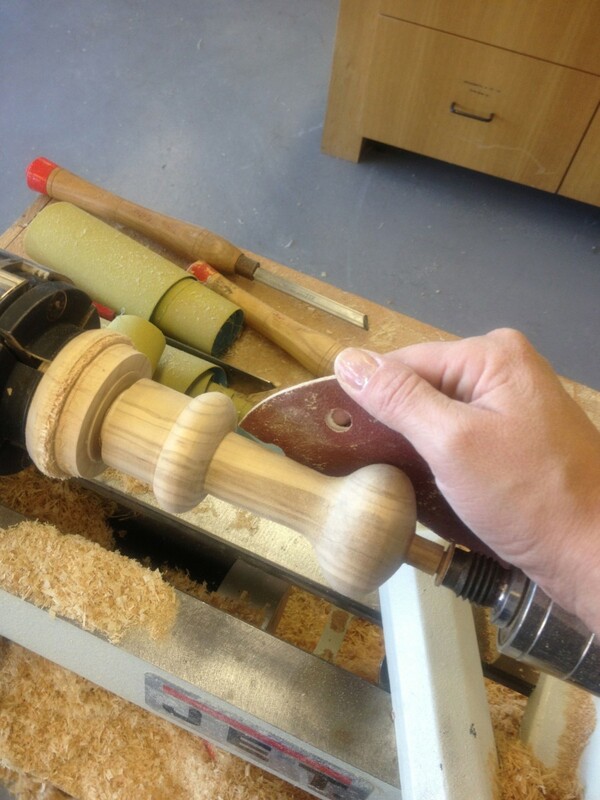 Now its time to bore out the body of the peppermill. In the body of the mill, you need to use 2 different size forster bits. First, put the top of the body of the mill into the scroll chuck and use a 1 11/16" bit 3/4" the way up the bottom of the mill. Then, turn the mill around, put the other end on the lathe using a jam chuck, and bore out the rest of the body with the 1 1/2" forstner bit. Depending on how ling your mill is, you may or may not have to use an extender on your forstner bit. Sand the body of the mill to your desired smoothness. Okay, now the body of the mill is finished. Now put the top of the top part of the mill into the scroll chuck and bore out 1 1/4" up with a 15/16" bit. This is to hold the top part of your grinder mechanism. Make another tenon on the top of the mill, this will fit into the body of the mill. Mark how high you need to go (in this case, 1 1/4") and make sure it fits into the top of the body of the mill, not too tight so you can't turn it to crush the pepper, but not too loose that it jiggles around. Turn the top around and turn the rest of your design. You can use a live center to hold the top on. Be careful in these last steps. I was excited that we were almost done and wasn't paying attention; ended up with a fairly large gouge. Fortunately, Pete is an expert woodturner and fixed it for me. Also note that there is a ledge on the bottom bead, its not round. That is for the body of the pepper mill to have something flat to connect to. If it weren't flat, it wouldn't sit right. Sand the top to same smoothness as the body of the mill and part it off. I recommend putting the mechanism into your mill right away, so your mill doesn't have a chance to go out of round. I had to use a Jorgensen clamp as it was to get the bottom of the mechanism into the mill, it's a very snug fit. Insert a set screw into the top, countersunk. Finish with your choice of finish, I used a few coats of tung oil. NOTE: the shaft of the Crush Grind mechanism is long and meant to be cut to whatever length you want. Even though I followed the instructions to the "Tall Pepper Mill", I still had to trim the shaft. It was very easy to cut with my jigsaw. In conclusion: I had a great time making this mill and I think it turned out great! If I were to make another pepper mill (and I'm pretty sure I'm going to) I would make it shorter or use the other Crush Grind mechanism (the one without the shaft). The part that took the longest in making this mill was boring out the body of the mill. I think a shorter one next time. I really liked the carbide turning tools, I think they are great for a beginning woodturner like me. The fact that you never sharpen them, just replace the tip appeals to me. If you want to start turning and only have a lathe (no tools or bench grinder to sharpen those tools) these can get you started. I'd like to thank Pete Carta for his stellar instruction (and some of these photos), and Rockler for the wood and tools!